Anderson employs two Heidelberg Quickmaster 46-2s. Print quality, range of applications, reliability and simple operation are the criteria that the ideal press must meet to gain a competitive edge. 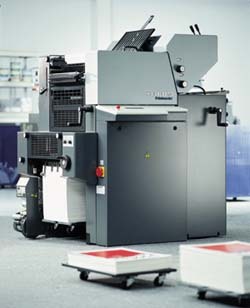 Our Heidelberg Quickmaster 46's excel across the board, incorporating features--many unprecedented in its class--such as program-controlled printing, fully-automated plate changing with Autoplate, central sheet-size adjustment, monitored sheet control, self-regulated inking and dampening systems, inching and crawl speed modes and automated wash-up devices. With their inherent flexibility, ease of use and numerous automated features, the Heidelberg Quickmaster 46's effortlessly achieve reliable, superior quality.